The Brake Motor is a combination of 3-phase Squirrel Gage Induction Motor with Electro-Magnetic Disk Brake A.C. or D.C. 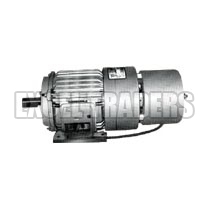 The company is a well-reckoned Supplier of cutting-edge Brake Motor in India. The Brake Motors are high in quality as these are procured from the reliable sources only. The Brake Motor can be availed from us in bulk quantities, at the most competitive prices. Capacity : Combination of three phase Squirrel Gage Induction Motor with Electro-Magnetic Disk Brake A.C. or D.C. When power is switched off with ordinary motor, the rotating parts will stop after some time but if Brake Motor is used rotating mass will stop instantaneously. Friction Liner Plate is only wearing part and this is easily replaceable.